Recently I witnessed two of my friends, the drummer from my ‘band’ called Dan get married to his girlfriend Linda on 21st september 2013. I’ve known Dan for several years now and he has been like big brother to me. And to witness him jump the broom with the girl that he loves ( from the time he asked her to marry him to the bride negotiations in embu till the moment she said I do to him) took me aback in awe of how God truly makes things beautiful in his own time. Yes. This is going to be one of those mushy posts. :-P. A poem actually, And its dedicated to Dan, his lovely bride and the many other friends I know are getting married over the course of the next few months. Its been amazing esp given the fact that these other friends are people I know who’ve met, bonded & pursued their relationships with God being the centre of it all; setting the pace for others to follow and learn from. Thank you guys, you’re truly an inspiration 😀 may you have a prosperous and beautiful marriage! 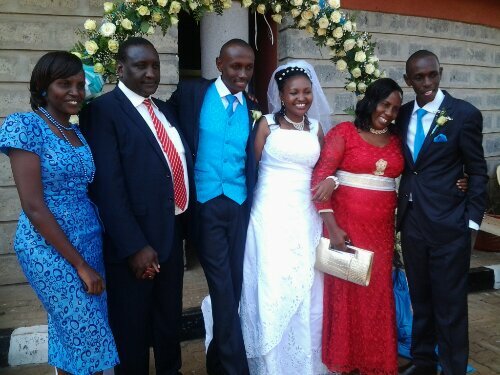 Above : Mr & Mrs Dan Mwangi. Also, to the other friends I know who are getting married .. This is my first ever poem, I’m still thinking whether or not to pursue this poetry thing tho’.. enjoy. Then your innocent smile left me weak. It’s time for you to Man up. He said, and step up your game. For Like a cheetah, I have seen you, my deer. Reform and move on, cause you know that’s how we do. In this temporal adventure called life. Just as Christ loved the church, I shall love you. Previous Post Ticket out of the friend zone? Well, it’s about time you Purchased it !! Thanks Danco its a great poem. Thank you very much for the lovely poem Dan :-):-):-) God bless you and keep us all. Quick one: out wedding is on 13th December, Caleb n Julz is 14th December. And I stand corrected, sorry for the slight mistake. I have rectified it and will keep all the said dates in mind. thats beautiful n yes i should pursue poetry. ..
how didn’t i know about dan’s wedding? Amazing!! Dan is now a married man. Thanks alot bro for this post, noma sana…made my day bro. God bless you abundantly and may He lead you in all your ways. Poetry could be one of your many talents within you, so go for it bro!! You are one blessed man and am honored to know you. Baraka. That It means a lot coming from you bro, it sure does!! !